Late night on an estate in Hackney and a van is being driven erratically. The driver is pulled over by the police and questioned. A woman on the street after a long evening's drinking never makes it home. A suspect, an arrest, a confession, a case done and dusted? There is much I liked about this novel, from the writing to the fast paced plot. I also liked the fact that Backlash is more of an inverted detective story. I don't run into those too often. The reader knows who the bad guy is up front, and the mystery is in seeing how law enforcement pieces the crime together--what exactly, if anything, did the suspect do and what could his motive be. One of the things I like about police procedural novels is seeing everyone work together to solve a crime. While there is often one or two protagonists who stand out over the other characters, solving crimes really is a team effort. A good police procedural acknowledges the internal struggles and frustrations that often face the team, while not overdoing it and drowning the story in politics and ego. Lynda La Plante found a good balance, I thought, in capturing the doubts and head butting that can take place. 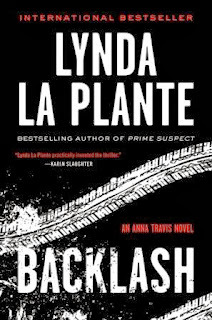 Backlash is more of a plot driven novel rather than a character driven one, as often crime novels are. In this instance, I felt there were too many characters and too much going on for me to really get to know any of the characters well (other than the antagonist). I imagine, as a series book, this would be a problem easily solved by my reading the earlier books in the series. Backlash is the eighth book in the series, and while this particular book can stand alone quite well on it's own, there were moments I wish I knew more about the characters' background. Anna Travis, the main protagonist, and for whom the series is named, is an interesting character. Clearly she is an intelligent woman who is a force to be reckoned with. She is diligent and thorough in her work. She carries her own emotional baggage which I think she does a good job keeping out of her work for the most part. That's why it was such a surprise when it all came to the surface later in the book. And yet, looking back, it makes sense. She has a job to do, and she does it well--but it has to affect her. It was good to see that it did, especially given past events. I really liked DCI Mike Lewis, who initially is given the reigns in the investigation into Oates, the suspect. While put out by his investigation being somewhat hijacked by his superior, Langston (who is supposed to be on medical leave) he handles it with class. Langston was one character I didn't particularly like. He was pushy and demanding. What irked me especially was that he got away with it so often. I had been excited about reading Backlash when I first heard about it and am so glad I did. Backlash had me reading late into the night. Lynda La Plante is definitely an author I want to read more of in the future. To learn more about Lynda La Plante and her books, please visit the author's website. I hope you will check out what others had to say about Backlash on the TLC Book Tours route! For some reason this isn't an author I have ever read. Don't know why as she is a favourite of both my sister and sister-in-law and as such her books are readily available. Great review, thanks for the recommendation. Tracy - If you do give her books a try, I hope you like them. I know that sometimes when my family favors an author it takes me forever to try them--if I do at all. Not sure why . . . I do enjoy crime novels like that - the tension keeps me turning the pages. Kathy - I agree! I love these types of mysteries. Sandy - I think it's important to mix things up in a series too. As you said it keeps the series fresh and different. I like how Sue Grafton has done that with her series, especially in the later books. Sounds good. Love me a good police procedural! Jenclair - I definitely want to read more by this author. I typically don't like to know who the bad guy is right from the start but I keep hearing good things about this book and her series in general so I must check it out. Love a good police procedural! Iliana - It makes for a different kind of reading experience, I think, but if done well, I really like novels written in this format. Susan - I hadn't known until recently about the author's television show. I wish I had seen it as I love a good police procedural. I wonder if it's on Netflix . . . I will have to look for it. I haven't read anything by LaPlante, but I may have a book by her. I'm not sure. This one sounds like something I would like. Joy - I am pretty sure I have one of her earlier ones on my shelf as well. I probably should have read it first. :-) I hope you like it if you do give it a try.